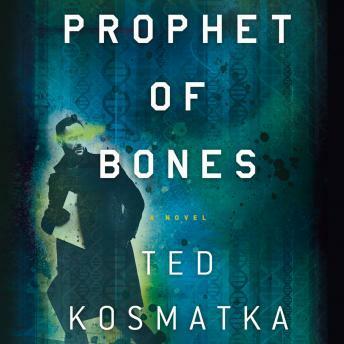 Ted Kosmatka's sensational new thriller, Prophet of Bones, thrusts listeners into an alternate present. Paul Carlson, a brilliant young scientist, is summoned from his laboratory job to the remote Indonesian island of Flores to collect DNA samples from the ancient bones of a strange, new species of tool user unearthed by an archaeological dig. The questions the find raises seem to cast doubt on the very foundations of modern science, which has proven the world to be only 5,800 years old, but before Paul can fully grapple with the implications of his find, the dig is violently shut down by paramilitaries. Paul flees with two of his friends, yet within days one has vanished and the other is murdered in an attack that costs Paul an eye, and very nearly his life. Back in America, Paul tries to resume the comfortable life he left behind, but he can't cast the questions raised by the dig from his mind. Paul begins to piece together a puzzle which seems to threaten the very fabric of society, but world's governments and Martial Johnston, the eccentric billionaire who financed Paul's dig, will stop at nothing to silence him.